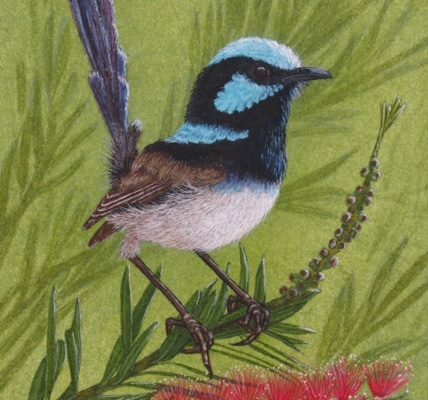 Margaret Rose Howick – Queensland Wildlife Artists Society Inc. I grew up in central NSW and every chance I had I would escape into the fields to get as close to nature as I could. I have always marveled at the perfection of the intricate design that Mother Nature creates all around us. I never tire of the amazing tapestry of tone, colour, texture, light & shade in everything I look at. I am also very tactile and enjoy the experience of touch, whether it be a little animal, a bird, fine & delicate mosses or massive & strong trees, they all have their own special feeling and beauty for me! I have also been an avid amateur nature photographer all my adult life. With every fine brushstroke, I aim to deliver the individual personality of each of my subjects. Through attention to detail, dimension, colour, light, and shade I need my birds to sing to you their own unique song. I need my marsupials to look back at you without fear or trepidation. I need my flowers to exude their own exciting colour and texture, sharing a wonderful moment in time. I find that abstraction will not achieve this for me and therefore time and effort must be spent to bring not only the best to you I can offer but a part of me in each painting I do. Please enjoy my special friends of nature. I trust that you will enjoy the visual experience as much as I have enjoyed painting them. I began painting in 1985 studying with various tutors, originally Colour and Design with guache for 2 years. I then explored drawing with charcoal, graphite and then acrylic for a year, then several years focusing on watercolour. 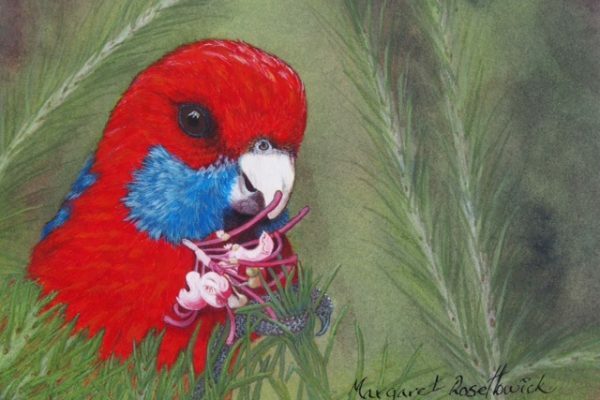 My preferred technique has been developing the art of three dimensional watercolour, finishing with guache, painting primarily birds and small marsupials in their forest setting and then a few years later adding flowers. I always use 300gsm hot pressed paper, mostly with watercolour and finish off with my fine detail in guache, coloured pencil, ink and sometimes acrylic for different effects. 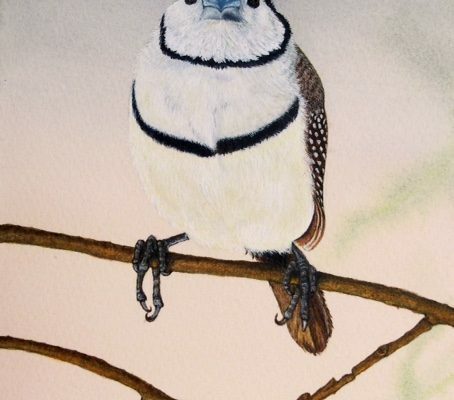 I have presented my work in local exhibitions and exhibited and sold my paintings through the Bunya Forest gallery in the Bunya Mountains for 10 years. I also participated in an Exhibition at the Dogwood Crossing Gallery in Miles in the Darling Downs in November 2015 presenting 11 paintings. I have had other private commissions also in that time.